Saving the Ark was a fund was set up to provide financial assistance to stray animals or owners that are going through financial hardship. This fund is built through donations. Anyone wishing to donate to Saving the Ark or learn more about the program can call us at (251) 342-2956. 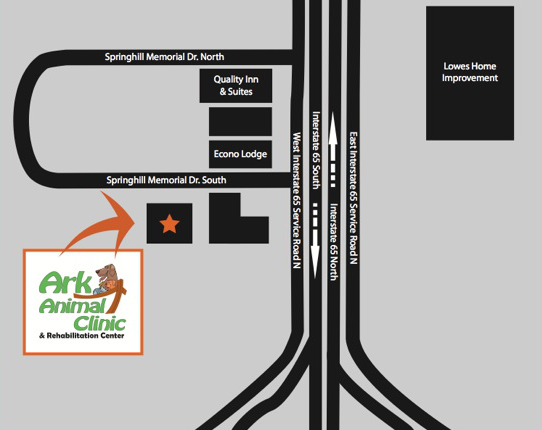 Thank you for choosing Ark Animal Clinic. Our primary mission is to deliver the best and most comprehensive veterinary care available for your pet. An important part of the mission is making the cost of optimal care as easy and manageable for our clients as possible by offering several payment options. Ark requires payment in full at the end of your pet’s examination and/or at the time of discharge. If you have pet insurance, we are happy to provide you with the necessary documentation to submit a claim to your pet insurance company. You are still required to pay in full at the time of service, then obtain reimbursement from your pet insurance company; we do not accept payment from the insurance company. If you have any questions, please do not hesitate to ask. We are here to provide the best veterinary care available for your pet. Same day appointment cancellations or no shows will carry a $25 fee that will be applied to your account. Surgeries cancelled less than 48 hours in advance will carry a $50 fee that will be applied to your account.